The soft pink topaz gemstones in these 6mm woven pink topaz stud earrings in 14K white gold are a pale, beautiful color that reminds you of the soft color of rose petals and sunsets. 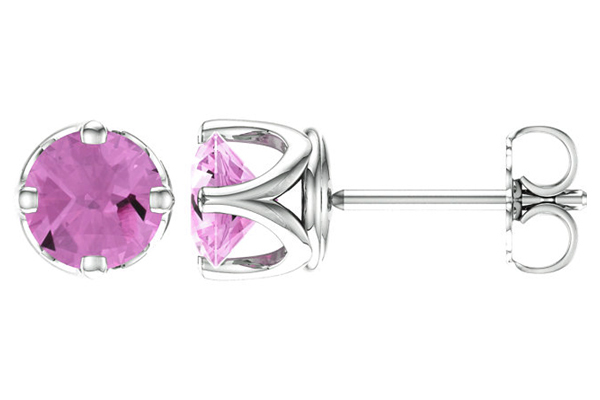 The authentic pink topaz gemstones are round cut stones, and measure 6mm each in size. They are set into 14K white gold earrings, complete with a woven pattern on the setting which draws the eyes to the pink topaz gemstones even more. The earrings have a friction push back post closure design, allowing you to keep your AA rated pink topaz gemstone earrings safely in place. We guarantee our 6mm Woven Pink Topaz Stud Earrings, 14K White Gold to be high quality, authentic jewelry, as described above.